It’s no secret that our family loves a good road trip. Because we don’t have any family around us, we find ourselves travelling A LOT. 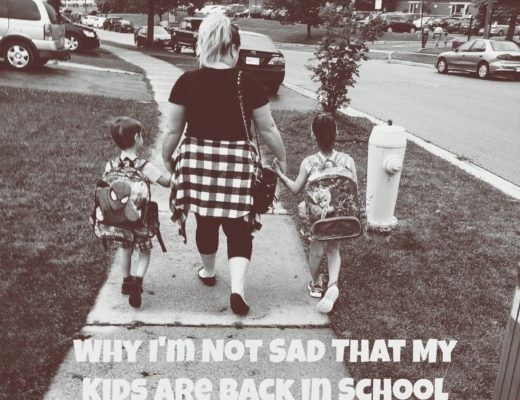 And luckily for us, our kids are (mostly) great travellers (we do have some car sickness issues that we deal with from time to time). For us, it doesn’t seem to matter what season it is, we are always willing to travel somewhere warm, fun and wherever family is! We are actually going to be driving down to Florida again this coming winter for family a vacation and we are getting SO excited! But before we go on any trip with the kids, there’s always a lot of planning that happens beforehand. Strapping three kids into carseats for any extended period of time means you better have a plan or else everyone will suffer! 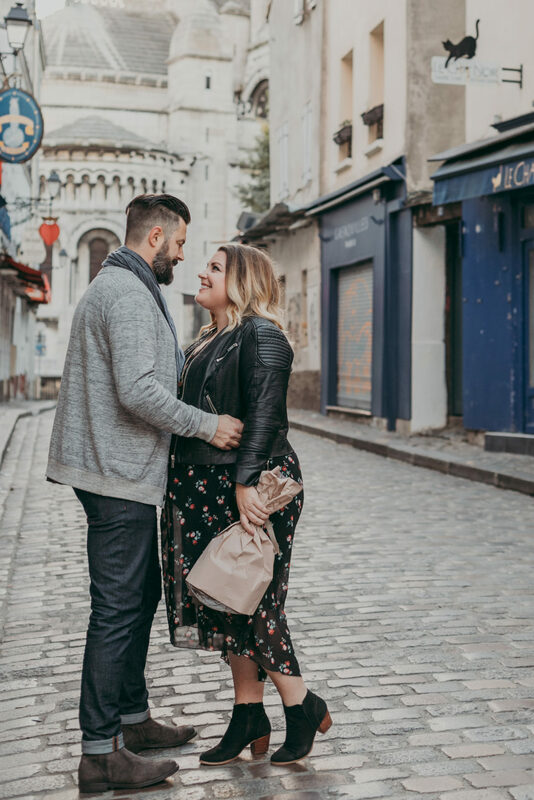 Before we had kids, I would never have worried about preparing other than packing my suitcase and a bag of chips for the road. But with kids, it’s a totally different ball game. 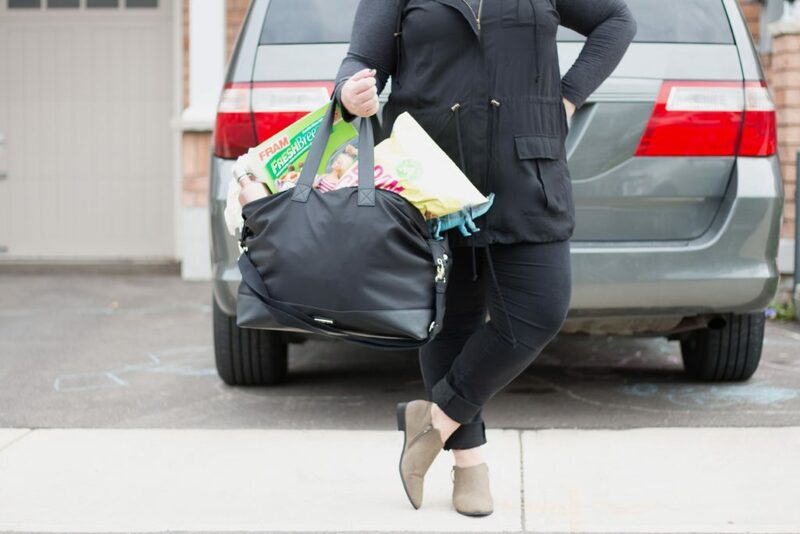 So today I want to share with you five ways to prepare for a road trip with kids. Not in any particular order but all equally important to ensuring you have the best trip possible! Before we had kids, we loved taking road trips that didn’t require much planning. We actually drove all the way from British Columbia to Ontario (drove part of the way through the US) using JUST a road atlas! This was long before Google Maps and even Mapquest existed so we literally followed this huge book and navigated our way from the mountains of BC, to the rolling hills of the prairies, down to the bustling city center of Chicago and back up through southern Ontario! 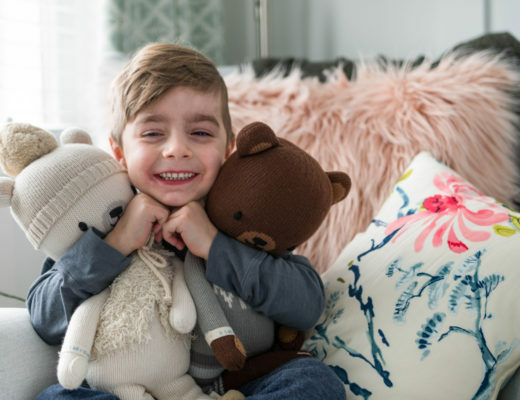 That was fun and we still love to try and incorporate some “off-interstate/freeway” routes into our drive, but it’s so important to plan our your route as well as resting destinations when travelling with kids. When we drove to Florida the first time with our three, we knew exactly which route we were taking, how many hours we would be spending in the car and where we were staying each night of the trip. We also made sure to plan out some fun activities along the way, stopping at various tourist attractions and parks so that the kids could stretch their legs and play. You can’t really plan those things if you don’t plan your route and the overall journey of getting from point A to point B. So plan it out before you leave and maximize your time on the road! Everyone gets hungry when they travel. I think it’s probably more out of boredom than actual hunger. But with kids, the hunger factor intensifies dramatically, especially with three kids! Buying food on the road isn’t really the best option either. Most of the time, you are hopping off the highways to fill up with gas and there isn’t much but greasy grub to offer your family. If you do happen to find a grocery store, it can actually be quite costly to buy pre-packaged snacks for your kids. 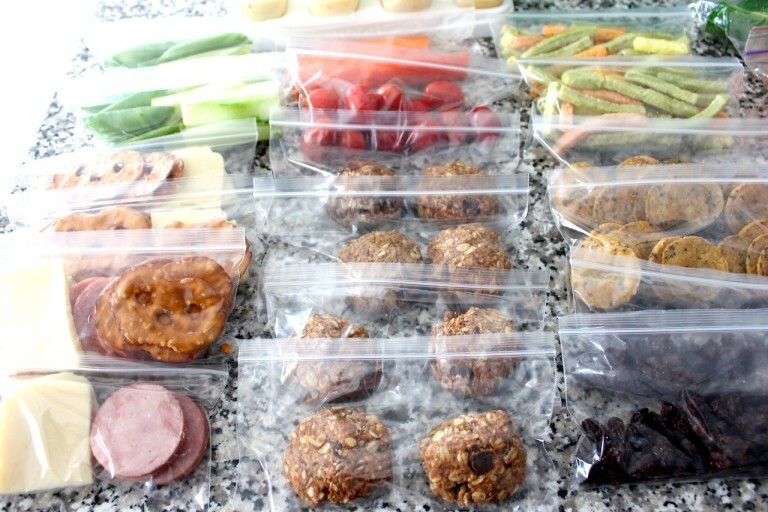 Planning snacks out BEFORE you leave your home can therefore save you time and money. Plus, you know what you are feeding your family is healthy. I love using plastic bags and/or small reusable containers to fill with pre-cut finger foods. Anything from cheese, kolbasa, pretzels, hummus, homemade cookies, popcorn, crackers, etc are awesome options. If you are crossing country borders, you do need to think about the food restrictions going into the country, but that being said, I’ve never had an issue declaring that we have some snacks for the kids to eat. If you don’t have built-in DVD’s in your vehicle, you’re going to want to think through what will entertain your kids for the trip. We do bring iPads for the kids, that are loaded with kids shows, songs and games. 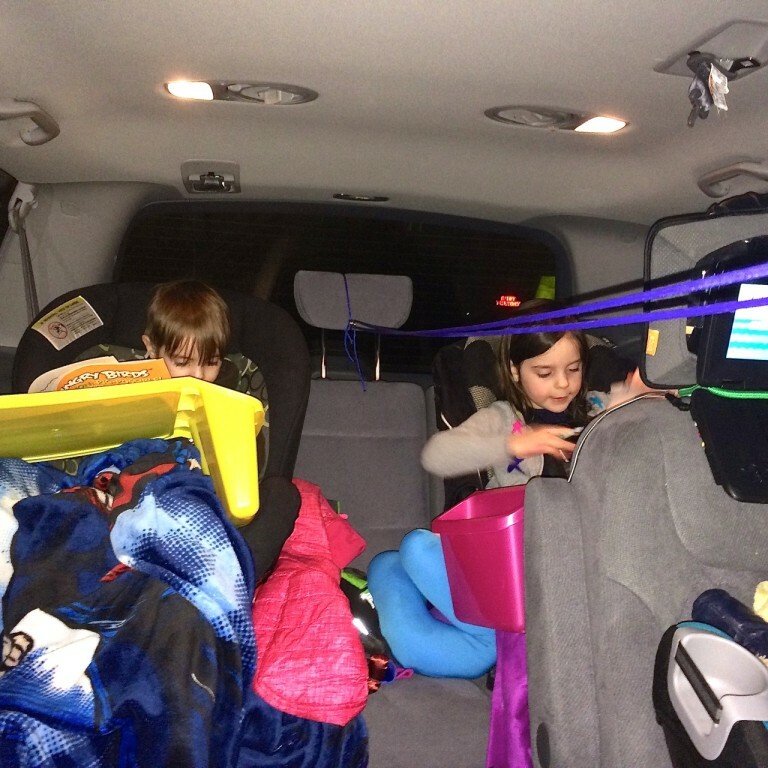 Let me tell you…if you are worried about your kids getting too much screen time…during a long road trip, that’s NOT the time to worry about it! Worry about it once you are home because those screens will be an answer to your prayers and help keep the sanity in the car! But that being said, I did really try (and will try again for our upcoming trip), to make sure that the kids had other activities that could entertain them while we drove. We got lap desks for the older two so that they could color and/or build puzzles. They actually loved doing this for a portion of the trip, while I had the iPads tucked away. Another awesome idea that I had found on Pinterest (I won’t take credit for it) is to buy some inexpensive toys for the kids from the dollar store and wrap them up with wrapping paper. Then at various points along the journey, take one at a time out and let them open it and play with it! This was actually a HUGE hit for our family! The kids so looked forward to getting their new gifts and it helped provide a lot of extra entertainment away from the screens! 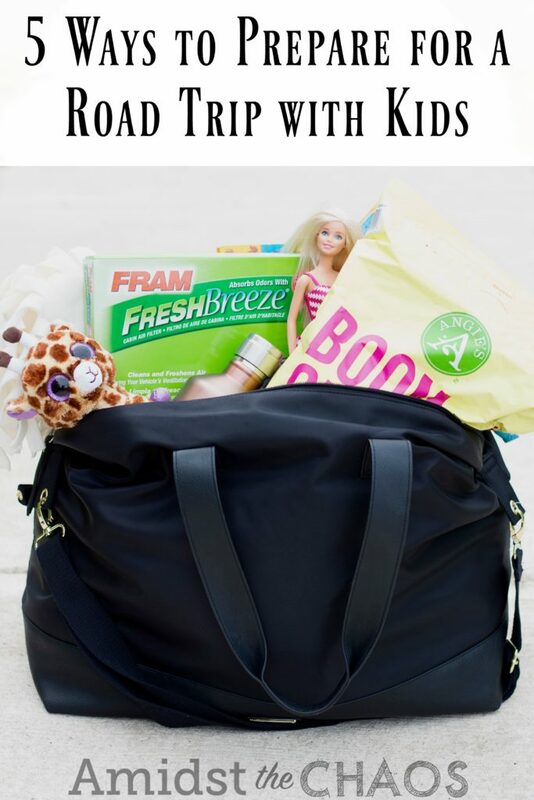 Especially if you are going on an extended trip, chances are you have packed A LOT of items for your family. If you are anything like my husband, you have challenged yourself to a game of luggage Tetris and WON the game with your amazing packing skills! This is GREAT news for your trip and allows you to bring everything you need for your time away. The problem is when you need clothing for the next day or worse, someone has an accident and you need spare clothing on the side of the interstate, somewhere in the Pennsylvania mountains because a kid just spewed their entire breakfast (speaking from experience here). You don’t want to be unpacking the entire trunk or overhead bin just for a new shirt and pants. 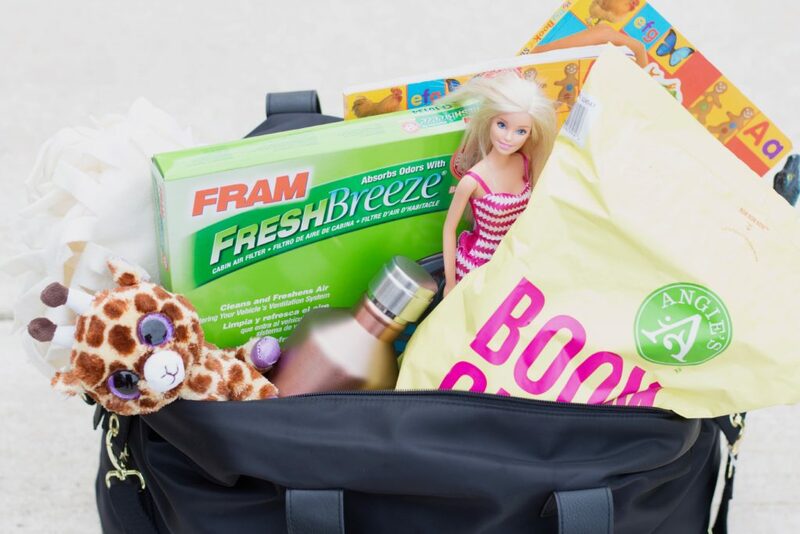 That’s why it’s SO important that you pack a separate overnight bag for your family that is easily accessible and that contains a couples extra items for your kids, should an accident arise (cause they always do). Last but certainly not least, after all the planning and packing, it’s so important to make sure that the vehicle you will be driving in for this extended period of time, is safe and clean for you and your family. Specifically, I’m talking about the air quality. This isn’t something we often think about because we don’t see it. It’s not a tangible thing that needs to get packed or sliced or programmed onto an iPad. But especially if anyone in your family has allergies or asthma, this is SO important to consider. Did you know that the air INSIDE of your vehicle can be up to SIX times dirtier than air outside?! That’s SO crazy! We think we are protected because we are inside the vehicle, not breathing in the pollution, meanwhile, if you have dirty air filters, it’s so much worse than outside. 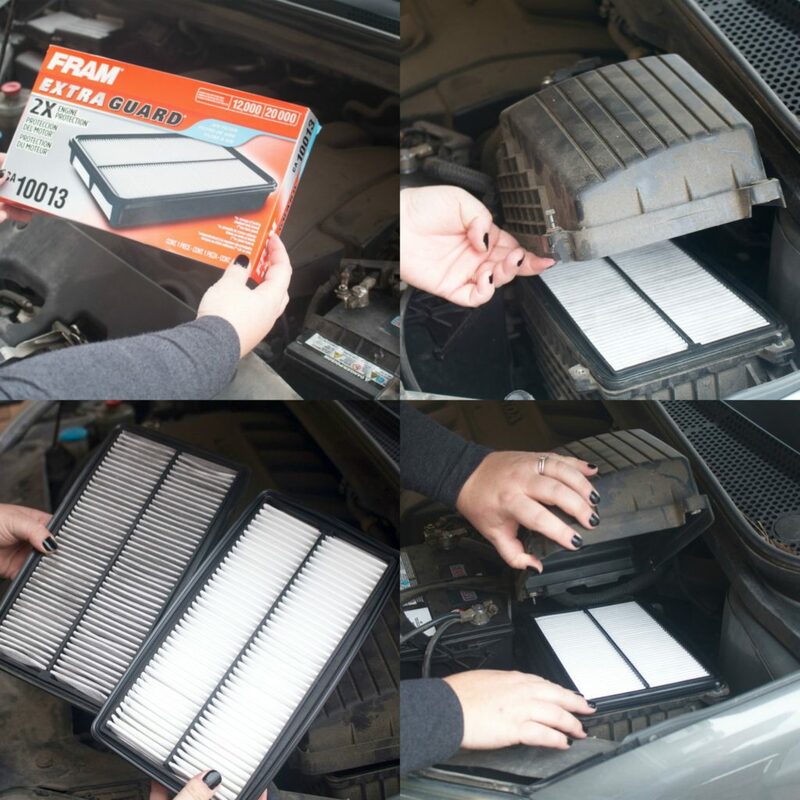 Luckily, we can remedy this situation by changing both the cabin air filters and engine air filters in literally 15 minutes or less with FRAM Fresh Breeze Air Filters. Yes, I actually did it myself! It’s super easy. Let me show you! To start, locate the air cabin filter which is behind the glove compartment. Pinch the sides of the glove box to release it so that you will be able to move the box all the way to the ground and access the filter area behind it. Once you locate the filter, press the release button, which is located on the left side (note: different vehicle makes and models will vary slightly. Refer to owners manual and/or instructions on cabin filter box for specific details). Remove the tray that contains the air filter and admire how dirty it is so that you will feel EXTRA good about replacing it with a clean one! Simply remove the old filter and place in the new one. Put the tray back into it’s compartment and close up the glove box. Seriously so easy! Check out the comparison with the one I had in there and one that I replaced it with! SO gross! It is recommended that you change your air filters every 24,000 km (about 12,000 miles). Note: Follow recommended change intervals as noted in your vehicle owner’s manual. While you are changing the cabin air filter, might as well change out the engine filter too. Did you know that these filters are your cars first line of defence to all the dust, allergens and pollutants trying to enter your car?! They can remove up to 98% of all those awful airborne pollutants entering your vehicle but also they help keep your air conditioning and heating systems running optimally. That’s why it’s so important to change them out! Changing the engine filter was just as easy, although it did require using a screwdriver to open up the filter compartment. Once unscrewed, simply open, swap out the filters and screw back together. 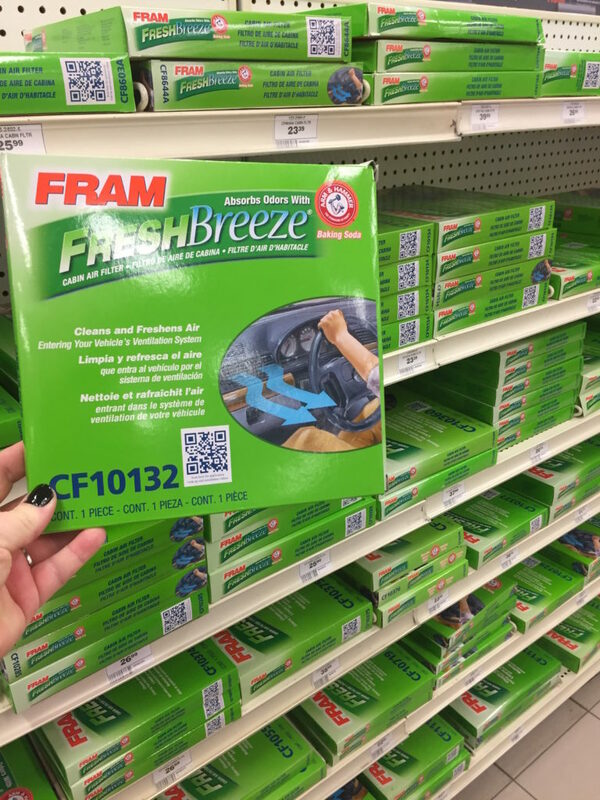 You can purchase these FRAM Fresh Air Filters at your local Canadian Tire. You will likely need assistance to find out what filter will work with your vehicle’s make and model, but the staff were so friendly and offered quick an efficient service in locating the right filters for our van. 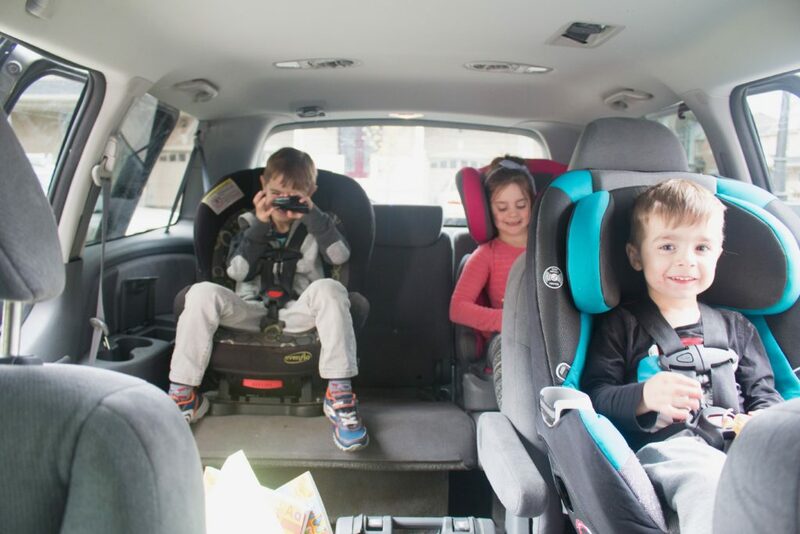 And that my friends, are my five ways to help you prepare for your upcoming road trip with kids! Road trips are SO fun to take with your family, you just need to really think through them before hand and have a great plan of attack for it to be successful! 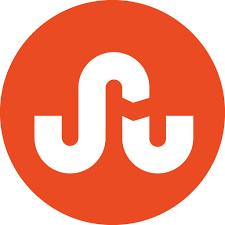 Let me know in the comments below what your favorite tip is and if there are additional ones that you might have! I’m a sucker for a good road trip, and can’t wait to start taking my daughter on them. I love the idea of buying small, inexpensive toys and allowing them to unwrap them at certain points along the trip. It would be fun to incorporate a scavenger hunt. I participated in this campaign earlier in the fall, and I couldn’t believe how easy it was to change the cabin filter. I am definitely converted to a diy-er! Happy to see you are now converted to DIY. You won’t regret it.